As Executive Vice President and Chief Operating Officer, Dan McCoy is responsible for assessing and implementing Beacon’s operational best practices enterprise-wide, working closely with our Market Presidents to ensure we are delivering full value to our clients. He also oversees Beacon’s four service centers and centralized operations department, assessing and implementing operational best practices enterprise-wide. 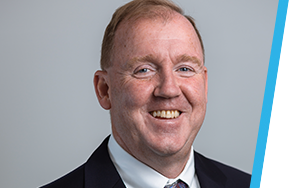 A 30-year veteran of the health care industry, Dan most recently served as Chief Operating Officer for Amedisys, a leading home health, hospice, and personal care company. In this role, he supported over 10,000 employees working in 320 care centers across the country. Prior to joining Amedisys, Dan spent over 25 years with Anthem, a Beacon health plan partner and one of the nation’s largest health benefit companies. His last Anthem position was Senior Vice President of Operations, supervising a team of seven Vice Presidents and a Director of Operations. He was directly responsible for the operations of 12,000 Anthem employees and more than 6,000 vendor partner employees. He was responsible for driving operational efficiencies, improving end-to-end service experience, and streamlining procedures to maximize profitability. During his tenure at Anthem, he also oversaw health plan operations, customer service, claims, membership billing, new business implementation, as well as renewal activity. Dan received his Executive Master of Business Administration in management from Eastern College and his Bachelor of Science in business administration from Temple University.